Hans-Christian Vortisch (author of Cthulhu - Waffen-Handbuch, GURPS High-Tech, GURPS Martial Arts: Fairbairn Close Combat Systems, and GURPS Tactical Shooting) has selected several dozens of the most typical or iconic weapons available to the discerning shooter in the 1920s and 1930s. These range from the famous Colt M1911 and Thompson submachine gun to lesser known but more widespread firearms. Each weapon is illustrated and described in detail, as are variant models. Significantly, each weapon's operation is described, as are its typical malfunctions. Finishing each weapon description is the movie use of the weapon - so you can see it in action - and a comprehensive statistics bar. Keepers are not forgotten either. 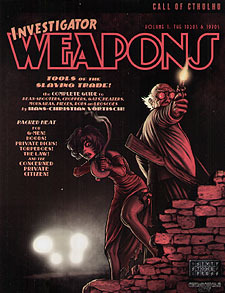 Typical weapons for non-player characters are suggested, as are likely weapons for cultists from around the world. A Keeper's chapter examines the consequences of magic on firearms and ammunition, and the effect of firearms on Mythos creatures.